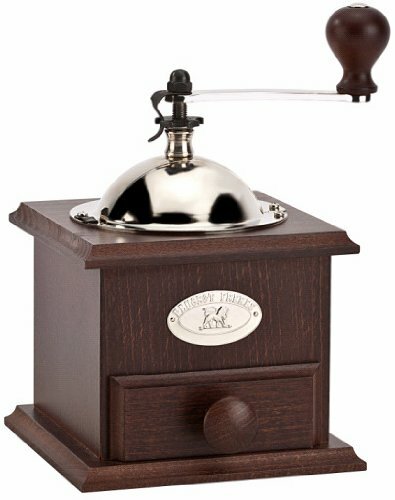 Made in France starting from 1840, Peugeot Nostalgie Hand Coffee Mill is a classic manual mill with the sophisticated appearance in walnut color that will quickly and efficiently convert your coffee beans into preferred ground coffee consistency, providing you with the maximum flavor for brewing. Peugeot Nostalgie Hand Coffee Mill is an efficient manual grinder with an adjustable mechanism that produces perfectly evenly ground coffee no matter how fine you need it – from espresso to percolator coarse. It is completely made of metal and beechwood, without any plastic elements that may spoil its exterior. The dimensions of the grinder are 5.1 x 5.1 x 8.25 inches and it weighs 2 pounds, with the capacity of nearly 2 oz of ground coffee. The mill comes with the lifetime warranty of mechanism and its bowl is made of chrome plated heavy gauge steel. Without refilling, you can ground between 2.5 and 3 oz of coffee beans. To ground a full hopper of coffee beans, you will have to empty the storage a couple of times. With its gorgeous classical appearance and great grinding possibilities, this coffee mill is not only a useful grinding option and indispensable tool in the kitchen but also a lovely item that may be a beautiful element of a table decor. Its design is really stunning and it definitely seems it was constructed with the great attention to details. It has a wide and firm base that provides stability when turning the grinding handle and super sharp blades increase the grinding speed while keeping it as quiet as possible. You can barely hear it. Besides being a great coffee grinder it can also be used for pepper grinding. Its specially constructed grinding mechanism that keeps the coffee quality releasing its aroma and essential oils is an environmentally friendly way of getting freshly ground coffee, pepper, or some other spices, ready for cooking and seasoning. It is easily filled and it’s pretty handy – it has a longer grind handle that provides greater grind leverage, making the grinding process much easier. It is easily cleanable. All you need is a small brush and a bit of patience. It has a precise setting for coffee grounds size. You may find it relatively slow when compared to the electric grinders but since it is a manual one, you should not expect too much from it when it comes to this criterium. In accordance with this, you should not be surprised that this traditional, classic grinder may cost a bit more than a standard, electric one – when buying Peugeot Nostalgie Hand Coffee Mill, you should approach it not only as buying a coffee grinder, but buying a lifestyle. The capacity of the drawer for the ground coffee is lower than you may have expected: The hopper can store about a quarter of an 11 oz package of coffee beans and the drawer where the ground coffee ends up should be emptied a couple of times during one grinding procedure. The adjustment of the grind sizes may take a bit longer than the adjustment of the electric grinders. It may cause a bit of mess during the usage when the ground coffee exceeds the limits of the lower drawer so it ends up over its edges. However, this manual grinder’s mess doesn’t really beat the quantity of mess created by the electric grinders. If you don’t want your coffee mill to jump around while you grind your coffee, you may want to hold it with your free hand, place it on a stable, not so slippery surface, or try and upgrade it with some rubber legs. The thing you’ll fall in love with when it comes to Peugeot grinders (which usually is not provided by the other producers’ grinders) is their awesome system of spice-specific grinding mechanisms. This means that Peugeot grinders have 7 unique spice mechanisms – for coffee, pepper, salt, wet salt, herbs and spices, nutmeg, and chili peppers. Every of those spices has its own, special grinding mechanism, followed by the perfect design and constructed of the best available material, in accordance with its purpose. Finally, what makes this grinder even more awesome is its French origin (while many others are produced in China), as well as the lifetime warranty that allows you to use your grinder carelessly. While it’s pretty obvious you’re going to need an electric grinder for larger amounts of coffee (because of the practical reasons), Peugeot Nostalgie Hand Coffee Mill is a perfect solution for small batches of one to four cups of coffee at a time, providing you with consistently ground coffee while at the same time taking you back through the time with its elegant classic appearance. Next story Coffee and pregnancy: Is it worth the risk? How do I adjust the grind? I just bought the Nostalgie,and do not know how to get a coarse(percolator)grind. Help! There are no instructions on how to adjust.